In 2007, popular fitness chain Life Time Fitness was having a hard time recruiting for key vacancies. That’s when they turned to using recruitment videos to fill in these positions. The results were positive. They got 30% more applications and a 110% increase in the number of candidates who passed the pre-screening process. “We’ve heard from the club leadership that these videos are a great representation of our employment brand. They’ve really helped recruiters have a more concise message when they go out to colleges and other job fairs,” says Life Time Fitness’ Organizational Development Manager Kendall Harrell. Overall, recruitment videos can increase job applications by a third and are 12 times more likely to be shared by job seekers to their networks. If you have a vacancy that you need to fill in your company, creating a recruitment video is a great strategy to attract top talents. 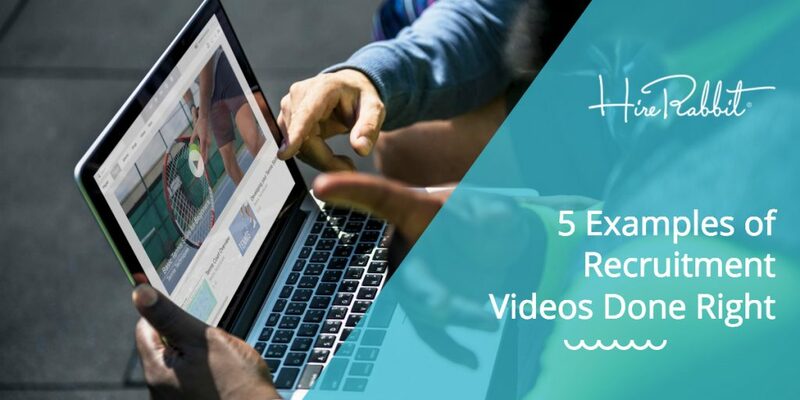 However, if you have no idea how to put together one, here are some of the best recruitment videos on YouTube that you can use as examples. This recruitment video from Google is more than 7 minutes long, a bit lengthy than the average recruitment video. However, it proves that length does not matter as long as the video engages possible candidates. The video opens with one of Google’s engineering director having a conversation with a colleague in a hallway. The video then goes on to talk about the unique benefits Google gives to its employees as well as the several projects that potential candidates could be a part of. It also includes other employees raving about their experience working with Google. The purpose of a recruitment video is not only to attract top talents. It should also solidify who your brand is. GoPro’s recruitment video is a winner in this department. The video features an employee playing soccer in the GoPro office. It doesn’t talk about the rudimentary vision, mission, and values of the company, but it definitely did a perfect job communicating one thing – it’s fun to work at GoPro. The video treatment is raw and action packed (assumingly taken with a GoPro camera) which is in line with the company’s brand and product promise. One of the biggest challenges companies face is bridging the disconnect between the applicants’ expectations when they apply for a job and what the job really is. For instance, those who are aspiring to work in the public relations industry may think that it’s a glamorous job, not realizing that there is a lot of hard work involved that happens in the background. This is why the Animal Humane Society recruitment video is such a good example of an effective recruitment video. The 3-minute reel features a day in the life of an Animal Human Society employee. One would expect a video overflowing with furry cuteness, and it does that, but what the video highlights more is the messy, heartbreaking, and emotionally difficult work that the job entails. Microsoft Research’s recruitment video takes a more serious approach. It opens with a montage of people, giving short but impactful one-liners about the work they do, and capping off by saying “I am Microsoft Research.” Its target audience is PhD graduates which explains the more business-like treatment, but it’s still engaging. One of the positive points of this recruitment video is how Microsoft Research framed what they do in the bigger scheme of things – essentially, how they are changing the world. The video also clearly defines what they’re looking for in potential candidates. It also doesn’t hurt that the video features employees from different ethnic backgrounds, underscoring how the company values diversity. With several recruitment videos competing for the attention of job seekers, it’s important for yours to stand out. And that’s exactly what Dropbox was able to do successfully. It features the typical storyline of employees sharing their experiences working with Dropbox, but the cloud storage company gave it a different twist. Instead of showing the actual employees, muppets were used making the video entertaining and hilarious. A recruitment video is a great way to improve your communication with top job seekers, but it’s more than just about whipping out your camera phone and shooting random footages and piecing them together. The videos enumerated above possess these qualities which is what makes them effective. Have a unique approach. Try to differentiate your video from everyone else so you can rise above the clutter. Stay true to your brand. Remember, your recruitment video should strengthen your identity as a brand and company. Don’t be something you aren’t. Quality matters. If you have the budget for it, hire professionals to help you. If not, just make sure you’re using a good set of equipment. If you’re going to feature employees giving their testimonials, allow them to be themselves in front of the camera. If possible, don’t use scripts and allow them to be spontaneous. Tell a story. Be engaging, entertaining, motivational, etc. This is a great opportunity for you to tell a compelling story of what it’s like to work at your company. Visit HireRabbit.com if you’re looking for other tips to improve your recruitment strategies or looking for a new platform to reach top job seekers. In the meantime, please feel free to comment below. Do you have your favorite recruitment videos? What did you specifically like about them? We’re interested to know.